In the summer of 2016, Sheena’s father called her from the emergency room. Her mother Shobha, a fitness trainer in the Bay Area, had experienced a seizure, and the doctors suspected a brain tumor. “I packed and moved back home from the east coast the next day,” Sheena says. 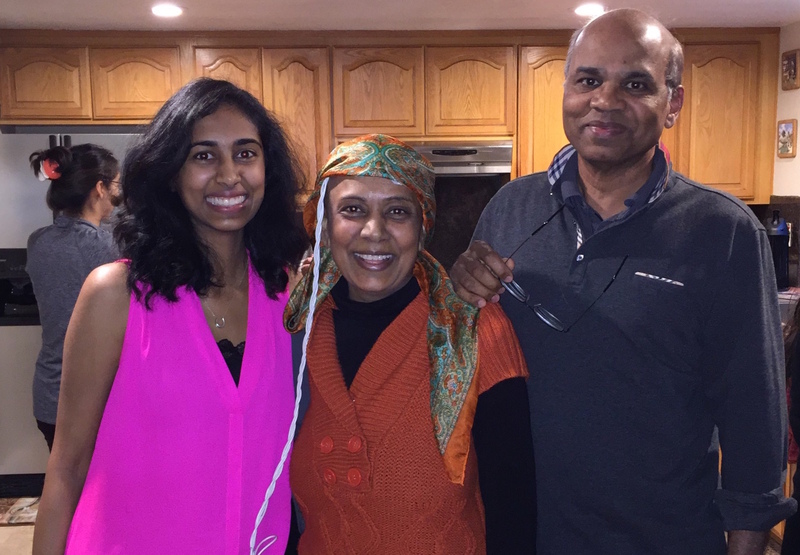 Shobha later had surgery to remove the tumor and received a diagnosis of glioblastoma (GBM). Her oncologist prescribed a standard GBM treatment of radiation and chemotherapy, but she had a bad reaction to the chemotherapy drug Temodar, and had to stop the medication. “That threw us off completely because there are very few treatment options for GBM,” says Sheena, who has a master’s degree in public health and had previously worked in an oncology department. Shobha’s doctor advised that she wait and watch for tumor growth, but she and her family weren’t comfortable with inaction. The family began looking into other treatment options for Shobha. “Every night, we researched clinical trials on ClinicalTrials.gov, and called the medical centers with trials in the morning,” Sheena says. Meanwhile, they sought guidance from ASK Cancer Commons’ Emma Shtivelman and from previously featured Super Advocate Stephen Western. Emma and Stephen helped Shobha’s family sort through the many complex enrollment requirements for each trial, and narrow the options to trials with potentially more promising treatments. Shobha ended up receiving treatment with an immunotherapy drug and a device called Optune. She also tried a number of other therapies, and worked with oncology nutritionist Patrice Surley, to incorporate dietary changes and supplements. It wasn’t an easy transition, but improving the odds for her was the main focus. Meanwhile, although she couldn’t do many of the exercises herself, she continued teaching fitness classes out of her home studio as she had for 15 years, while Sheena and her father worked from home. A year later, Shobha’s symptoms gradually returned, and her family pushed for an MRI, which revealed that the tumor had regrown. To their dismay, the size of the tumor disqualified her from participating in a particularly promising clinical trial that involved surgery plus injection of MDNA55, a toxin that targets glioblastoma cells. 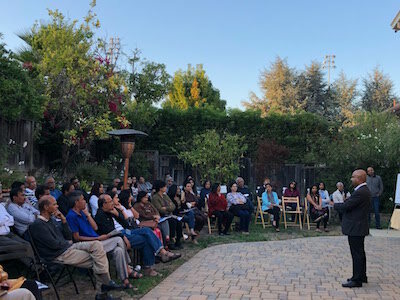 At this point, Shobha had started travelling to Los Angeles regularly to receive second opinions from Santosh Kesari, MD, PhD, a neuro-oncologist recommended by glioblastoma survivor and patient advocate Greg Cantwell. “Dr. Kesari really, really fought for my mother,” Sheena says. 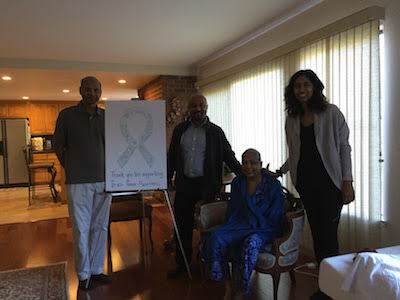 After battling paperwork, back-and-forth calls, and a rollercoaster of promise and disappointment, Dr. Kesari, her neurosurgeon Dr. Achrol, and their team were able to arrange for Shobha to receive the MDNA55 treatment through the U.S. Food and Drug Administration (FDA)’s compassionate use program. The treatment worked well for Shobha for a year, though she experienced some side effects. She is currently undergoing treatment in Los Angeles for a different trial. 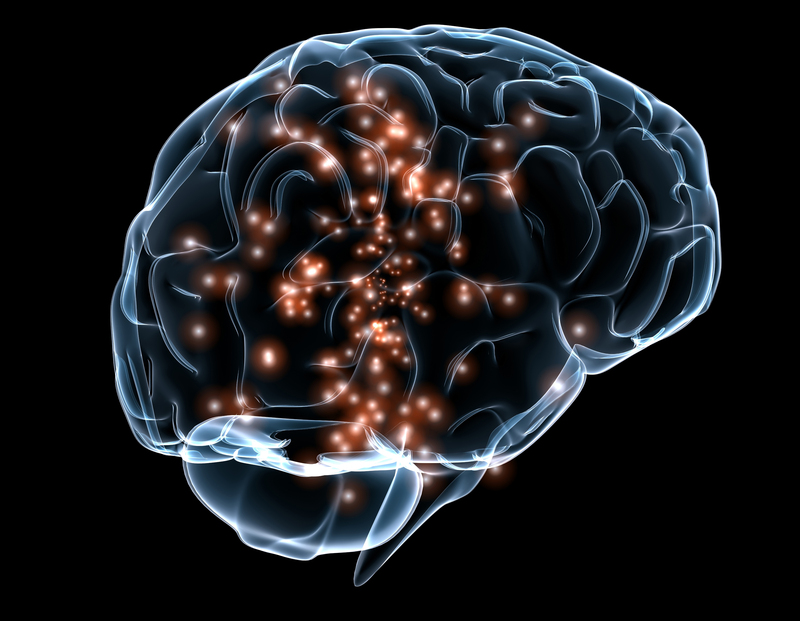 Brain tumors are incredibly challenging on the patient and patient’s family due to any number of unexpected symptoms that can show up depending on the tumor location, and medication side effects, including physical limitations such as walking or using the bathroom to cognitive decline, memory and speech issues, vision issues, and extreme personality changes. For this reason, it is also one of the most financially difficult diseases on the patient and family. Professional caregivers can be hired but are usually not covered by insurance. From a practical standpoint, after every scan, Sheena suggests getting multiple copies of the cd so that it’s ready to quickly mail out to brain tumor centers, if needed. It’s helpful to keep an updated Word/Excel file of all the latest results, labs, scans etc., so that precious time isn’t wasted collecting that data, in case it is needed for clinical trials and new physician appointments. She also says she wishes she had registered her mother as a patient in more hospitals when she was feeling well, so that they could easily get appointments and more opinions later on when they needed them urgently. For seeking out information on treatment and other aspects of the glioblastoma experience, Sheena recommends online support groups (such as those found at Inspire and Facebook), as well as services like ASK Cancer Commons and people like Stephen and Greg. “NovoCure (NASDAQ: NVCR) announced today that the National Comprehensive Cancer Network (NCCN) has updated its clinical practice guidelines to recommend Optune® in combination with temozolomide as a category 1 treatment for newly diagnosed glioblastoma (GBM) in its globally recognized Clinical Practice Guidelines in Oncology (NCCN Guidelines®) for Central Nervous System Cancers. “The addition of tumor-treated fields to standard therapy with temozolomide prolonged deterioration-free survival without negatively influencing health-related quality of life among patients with glioblastoma, according to a secondary analysis of a phase 3 clinical trial published in JAMA Oncology. Adam and his wife Whitney, parents of three young children, chalked up the incident to holiday stress. But over the next year and a half, he kept having similar inexplicable episodes. Finally, in May of 2016, an MRI scan revealed a 71-milimeter tumor in the parietal lobe of Adam’s brain. The episodes had been seizures—symptoms of the tumor. “When you have an MRI scan like that, things start to move really quickly,” Adam says. A few days after the scan, he was in the operating room to remove the tumor. The impact of the surgery on his brain left him in a wheelchair, and he needed intensive physical therapy to restore his ability to walk. Meanwhile, Adam’s tumor tissue was analyzed, and on June 10, 2016, he received a diagnosis of glioblastoma. 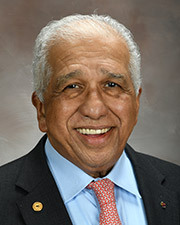 He began a standard treatment protocol of initial chemotherapy and radiotherapy followed by a long-term, 11-cycle chemotherapy regimen to keep the tumor from growing back. In late 2016, Adam’s oncologist suggested that he supplement his standard treatment with Optune, a device that had recently been approved by the U.S. Food and Drug Administration. Optune is a portable device worn on the head that produces an electrical field intended to disrupt cell division, thereby preventing tumor growth. Adam says that his experience with Optune’s manufacturers was “terrific,” and he used the device for over two months. Ultimately, however, he and his wife decided it wasn’t for them. 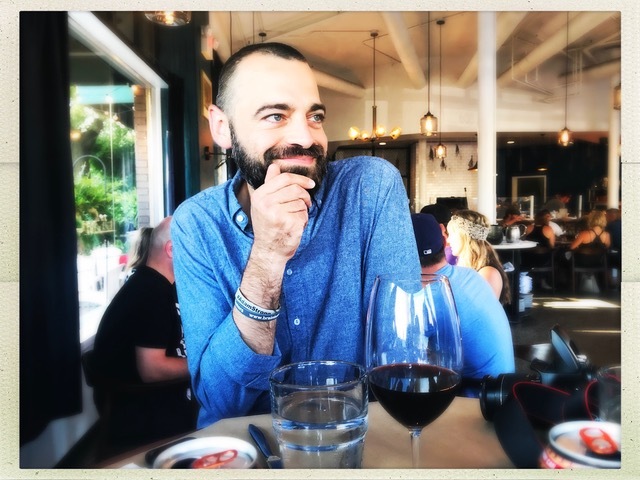 As a graduate-trained philosopher with a penchant for writing, Adam was compelled to document his glioblastoma experience on a blog he named Glioblastology. He credits his father and grandfather, both pastors, with instilling him with a knack for storytelling. “My grandfather was a loud, larger-than-life figure with a belly laugh, and storytelling was commonplace around the dinner table any time we visited,” Adam says. So when Adam received his glioblastoma diagnosis, he says, it felt natural to share his story online. After publishing many posts, Adam was thrilled to discover that what he was doing on his blog—and what so many other cancer patients do—had a name: narrative medicine. In this approach, narrative structure is applied to patients’ experiences with illness and treatment in an effort to enhance the healing process. Adam became especially interested in the works of narrative medicine practitioner Rita Charon, MD, at Columbia University. After studying Charon’s work, Adam was honored to present at a medical ethics conference, with Charon in the audience. An example of Adam’s take on narrative medicine is featured in his guest post at the science communication blog, PLOS SciComm. Adam is actively involved in brain tumor and narrative medicine communities, including the National Brain Tumor Society, and he has shared his perspective in many presentations and publications. Recently, he wrote an open letter to Senator John McCain after news broke of McCain’s own glioblastoma diagnosis. Over the course of his treatment, Adam has also found valuable support in the #BTSM (Brain Tumor Social Media) community on Twitter, which was co-created by fellow brain tumor patients Liz Salmi and Charlie Blotner. Community members interact with each other regularly by tagging their tweets with “#BTSM” and by participating in live monthly tweet chats, which Adam now co-moderates. “If there’s something that you’re wondering about or that you think others in the brain tumor space could learn from, you can tweet it and tag it with #BTSM, and you’ll get thoughts and support from the community,” Adam says. Adam says that his background in philosophy has helped shape his approach to glioblastoma treatment. As a graduate student studying the philosophy of science, he developed an acute sense of the limits of human knowledge and understanding. “I was equipped with this humble way of viewing scientific theories that taught me to ask questions and never be too confident in the answers, knowing that throughout history, our theories have been evolving,” Adam says. Adam has also taken a thoughtful approach to discussing brain cancer with his kids. He has found ways to frame his disease using words and ideas his kids can understand, instead of avoiding the topic altogether. For instance, when Adam was recovering from his surgery, his five-year-old son expressed his concern about his dad’s wellbeing. 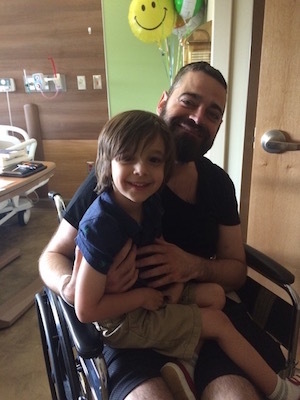 Off the top of his head, Adam came up with the idea to compare his surgical incision and staples to a knee-scrape—a concept familiar to most kids. Adam says he would advise other parents with cancer to be honest and frame things in terms of their kids’ level of understanding. Despite his advanced diagnosis, Adam has not experienced many of the symptoms commonly associated with glioblastoma. “So many people in the brain tumor community have suffered language processing issues, cognitive impairment, and more as a result of either the tumor or the treatment,” he says. “Fortunately I have tolerated treatment well, and while I do have some motor and sensory symptoms, I’m just about as sharp as I’ve always been.” Adam and his wife have connected with a palliative care doctor to proactively prepare themselves for cognitive decline, a near universal symptom of disease progression for people living with a malignant brain tumor. The seizures that portended his diagnosis still play a big role in his life. Specifically, Adam regularly experiences focal seizures, in which he gets lightheaded and dizzy with tingling, numbness, and weakness on the left side of his body. The seizures are more likely to occur if he has been working hard, such as by writing. “I can feel the onset of a seizure pretty well,” Adam says. 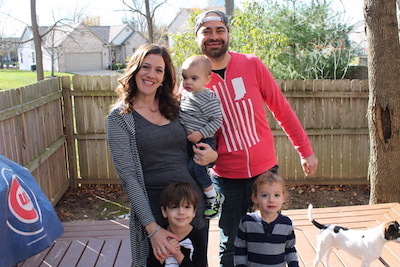 “I know what my triggers are, and I remind myself to schedule my days around that.” Medication is also helpful in preventing seizures, but Adam notes that many fellow brain tumor patients find these treatments prohibitively expensive. With his symptoms well-controlled, Adam is often reminded that people tend to assume that everyone they meet is healthy and able-bodied, unless they see an obvious sign otherwise. Read Adam’s writings and learn more about his activities at his blog, Glioblastology. You can also follow him on Twitter and follow his wife’s writings on her blog, Faith, Hope, and Wine. “Novocure (NVCR) announced today results from its phase 3 pivotal EF-14 trial adding Optune to temozolomide for the treatment of newly diagnosed glioblastoma (GBM), including results from health-related quality of life analyses, were presented at the American Society for Radiation Oncology’s (ASTRO) 2017 Annual Meeting in San Diego. This marks the first presentation of EF-14 five-year survival and quality of life data at a radiation oncology conference. “Researchers are hoping that a proposed phase II study exploring use of the Optune system in patients with recurrent grade III malignant glioma will expand the indications for the tumor treating fields (TTFields) device beyond its current FDA-approved use in recurrent grade IV glioblastoma.